EQInterface Forums > Tutorials & Info. > Misc Tutorials & Info. Symlinks are like shortcuts, except they let us reorganize files without breaking dependent applications. 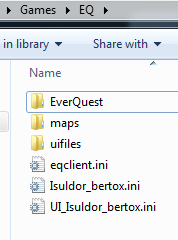 In the past, browsing into the EverQuest root folder caused my Windows file explorer to hang momentarily. That's because there's so many darn files in that folder. So to fix that, I'm creating a new root folder for the game, and only putting files and folders that I commonly access there. The first step of this process is to move the location of the game folder. It's a little cleaner to install the game to this new path (your uninstallers would still work then), but that probably isn't convenient for most people reading this. No big deal. Finally, make sure the game shortcut points the new location of LaunchPad.exe. Full disclosure: to be perfectly honest, this problem doesn't affect me anymore since I use a solid state drive. However I still wanted to do it to placate my ocd. Your mileage may vary. Use at your own risk. I use this exact method for my layout, I also have my SIDL links and UIerrors files mapped. Primarily for all of my UI work I do.